Some of you may recall I mentioned TAPS – Tragedy Assistance Program for Survivors in Vlog #2 when Jeremiah & I went to Sevenly. For the sake of space/time, please watch Vlog #2 or go to the TAPS website, I linked both above, to read more about their mission. Long story short, they are a military charity that provides support to those left behind after a member of the military passes away. I was really interested in getting to know their program better, so I drove down to the Disneyland Resort to help out at their booth at the Disney Half Marathon. Below are a few pictures I took at the event! Day 1 with Carol & Marie – Team TAPS Race Directors, & other Team TAPS supporters! I got to write the caption for this picture! My Social Media skills come in handy even when volunteering! Overall I had a wonderful experience volunteering with TAPS. I handed out race packets to the runners on Team TAPS, answered general questions, & helped out where I could. I learned a lot about the people behind TAPS, the survivors the program benefits, & the program itself. I appreciate that TAPS provides support no matter how the military member passed away, it doesn’t have to be battle related. It can be anything from car accidents to long term illness, etc. 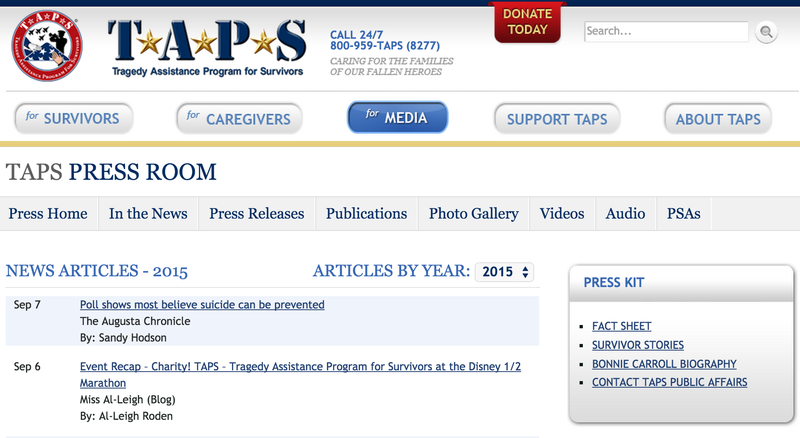 I also appreciate that TAPS reaches out to more than just immediate family. They support ANYONE who is suffering after experiencing a military loss, from unmarried partners to best friends to civilian coworkers to church friends, etc. That’s really important because for the most part, support goes toward immediate family, which obviously is not a bad thing, but there are more people to think about. I’m not talking about monetary support, I’m talking about emotional support. Death affects everyone differently & you never know who is able to handle these types of situations on their own or who might need more help. The person that sat next to a military member every Monday & Wednesday night for English 101 might be feeling their loss almost as intensely as the immediate family – & certainly not for the same reasons, but does that make their feelings less meaningful or make them any less deserving of help? I don’t think it does. I truly feel inspired after this experience. I have previously volunteered with the Wounded Warrior Project & have met special people through those amazing events, but there’s a bit of disconnect because I’m not a veteran or really associated with the military other than through my volunteer work. With TAPS however, I got to meet survivors, a position I can identify with more easily. While not military related I’ve experienced the loss of members of my immediate family & for a brief time, I was part of a military family & lived with someone that was working through PTSD. I watched him struggle & I know how helpless you feel as a bystander. It’s hard to watch someone you love be plagued by demons brought on by something that’s a huge part of their identity, they can’t just shake it off, it’s part of who they are no matter how much pain it brings them. One of the families I spoke with this weekend lost their military member to suicide & it just broke my heart. A majority of the military members being remembered this weekend looked like they were around my age. It’s one thing to hear the statistics, but to be face to face with survivors that have lost someone I could’ve dated, been friends with, gone to college with, worked with etc…makes me cringe to think how much we all take for granted. These military members will never see a beautiful Southern California day, never volunteer for a cause they’re passionate about, never run, never see their families, never go to Disneyland, never go on vacation, & their survivors will never experience these things without a tinge of sadness for the person they’re missing. Yet all of those activities occurred this weekend for other people & they probably didn’t give them a second thought. It’s crazy to think that I could have met any of these people under completely different circumstances, yet we were brought together because of the tragedies in our lives which have shaped our lives & led us to this place. To me, that’s the mission of TAPS. Yes, bad things happen & we all experience loss, but we’re never truly alone, we just have to find people on a similar path. 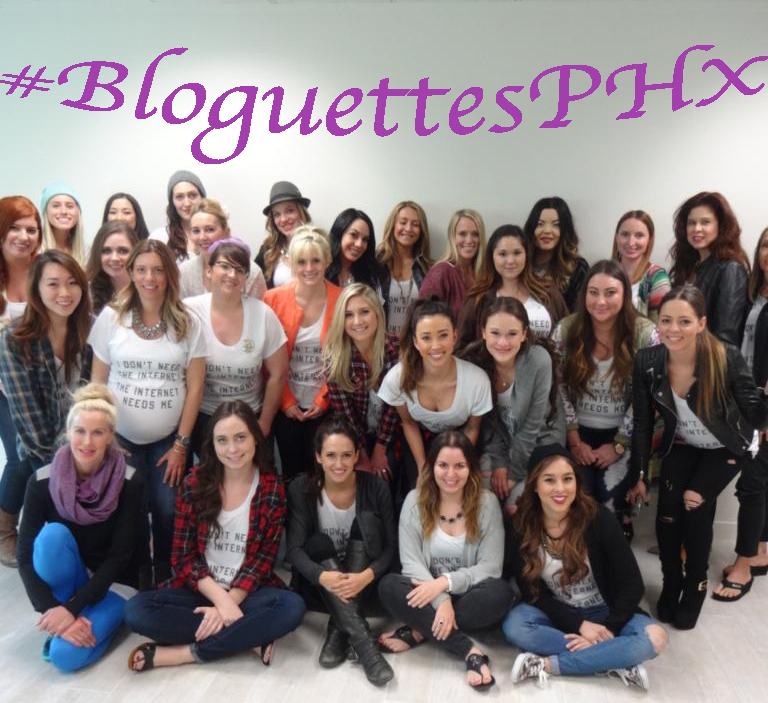 Charity & Event Recap! 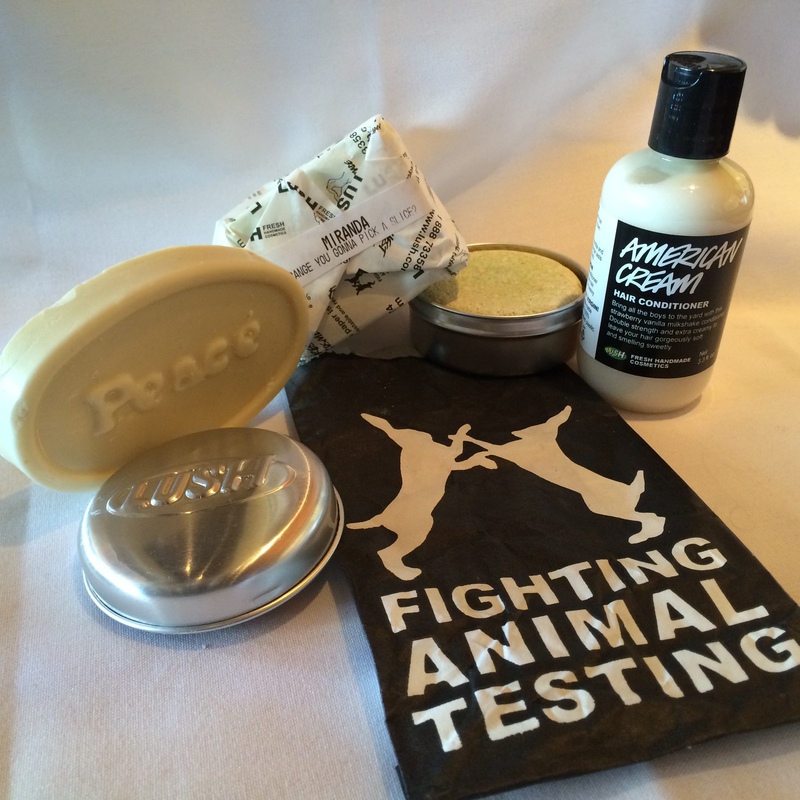 #YellowForSeth @bethematch & @lushcosmetics #freshlypicked Scavenger Hunt! 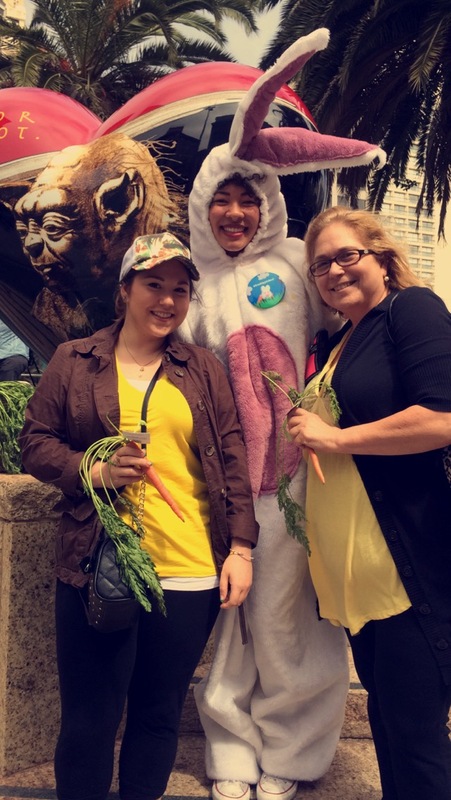 My mom & I with the Lush Cosmetics Bunny wearing Yellow For Seth during the LUSH Freshly Picked Scavenger Hunt! I also participated in another activity that hopefully some of you participated in as well. Today was “Wear Yellow For Seth”, a day of support for a 5 year old boy named Seth. He was born with Severe Combined Immunodeficiency Disorder (SCID), which basically means he has no immune system – no way to fight off infections. His only chance of survival is a successful bone marrow transplant. He had his first transplant at 7 months old, but his body rejected it. He’s now preparing for Round 2. I’ve heard different stories but I was under the impression that Seth and his parents made a video asking his friends and family to wear yellow (his favorite color) today and send him the pictures so he can see how many people support him as he prepares for this next set of procedures. The video became viral and the hashtags WearYellowForSeth & YellowForSeth started popping up everywhere! I’ve also heard that the family made the video with the intention for it to go viral and spread awareness of SCID and the need for bone marrow donors. Either way, I think it’s a really sweet gesture we can all take the time to make for a sick little boy. They aren’t asking for any money or donations of any kind. They just want to see how far their message will spread and show Seth some support! I’ve always been a big supporter of spreading awareness for the need for more bone marrow donors. I’m a registered bone marrow donor – although unfortunately I’ve never been called upon to donate. As soon as I turned 18, I signed up with Delete Blood Cancer DKMS & they added me to the Be the Match national bone marrow donor registry – click here to read Be the Match’s FAQ & see if donating bone marrow is something you’d be interested in! After a quick chat with a really sweet employee about the Lush products we already owned and what kind of scents we liked, we were given our goodie bags. These goodie bags were SUPER GENEROUS! I received a 3.3 oz bottle of American Cream hair conditioner and a Karma Komba shampoo bar PLUS a tin to keep the bar in. The Shampoo Bar & tin cost $12 & $4, respectively, I was extremely grateful to receive these amazing products basically for free! My mom received a healthy chunk of Miranda soap and a FULL SIZED Peace Massage bar – which retails for $14!! All in all, while I was slightly disappointed about the lack of adventure, Lush more than made up for it with their wonderful goodie bags. Thank you Lush Cosmetics!! I hope you all had a wonderful Friday! If you didn’t wear yellow, there’s still time! Before you head out tonight, add something yellow to your outfit – it doesn’t have to be big! Snap a pic, tag me or mention me, @missal_leigh (on Twitter, Snapchat, & Instagram), and don’t forget to hashtag #WearYellowForSeth and/or #YellowForSeth. Also, let me know in the comments below what some of your favorite Lush products are – I need to start a shopping list! 😉 Thanks for reading, until next time!